Quite disappointed with the shipment of the winners for my most recent giveaway. The books should have arrived prior to Christmas-they were processed through Amazon, got in notices that they would not arrive until early-to-mid January :(. Sorry to my winners! Winners Selected, Books On the Way! The GoodReads Giveaway has ended for Blizzard as of last night, at midnight :)! The paperback copies have been mailed out, those winners in the US should expect to receive their copies within 1 week, while those in Canada can take 6-12 days. Congratulations to the winners, I hope you all enjoy the book and would like to thank All who entered to win Blizzard <3! I’m ecstatic for the winners and their feedback! Today is the last day to enter to win 1 of 6 paperback copies of Blizzard through the GoodReads Giveaway! You can enter Here! It’s always exciting when I get to mail off copies of my books to the winners, I always wonder if they enjoy it, if they have those same emotions I do when I receive a book <3_<3! There are still so many on my TBR, many I have not yet added, that I will be reading in the coming months. Even more-so, I plan to get a nice chunk of writing done in the next few weeks. Yes, my date has continued to slip. However, that will stop here very soon :)! Alright, some positive news! I have submitted my maps for the books to be revised by a most talented individual! You can find him on Instagram: @anduril38. I can’t even begin to tell you all how excited I am to have him revise and beautify my maps xD! He will be working on the final map, as well. First, however, I need to get in gear with writing :S. I wrote 600 words the other day, but I’ve been busy getting my physical health in order, and my thoughts together for this last book! Honestly frustrated I have done more for this book. As it turned out, all the allergic reactions to the surgery, which only cleared up in the last week, week and a half, entirely was a result of my weakened immune system and (mild) liver disease. Fun times, folks, fun times! The Goodreads Giveaway to win 1 of 6 paperback copies of Blizzard is well underway, only 8 days remaining to enter! Don’t miss your chance, and share the news with your friends and family :D! Enter Here! Blizzard Goodreads Giveaway Has BEGUN! We Are Live folks! 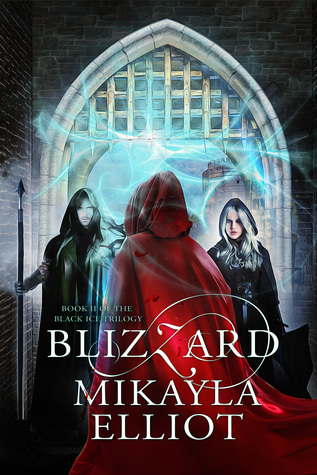 Enter to win 1 of 6 Paperback copies of Blizzard through Goodreads, link provided below! Running Today through to December 14th for US & Canada! Giveaway ends December 14, 2018. Blizzard eBook Coupon & Paperback Giveaway! As promised, here it is! You can now get Blizzard’s eBook copy at 50% Off through retailers such as B&N, Smashwords, iBooks, Kobo, and more with the code, AR34V! This coupon will be available, unlimited number, through December 20th! On Top of that, I will be hosting a Paperback Giveaway of Blizzard through Goodreads for the US & Canada! This giveaway runs December 2nd-14th, don’t miss out on your chance to win 1 of 6 copies, just in time for Christmas ;)! Link Coming Soon, so watch out! I’m so excited, and hope you are as well _^! This is my Favorite Time of Year! Blizzard, Completed Certification, and Beta Readers! Many thanks to Booked J for taking time to read and review my book, Blizzard! I love sharing reviews such as these, and making sure other reader’s have a chance to see what other works the reviewer has shared! Check out the review Here! =^.^= I am humbly flattered, and excited, as well! I took my Six Sigma Yellow Belt Certification testing this past Friday and Passed! Now I can shift my free-time focus to writing Hail! I, myself, am so ready to get back into the swing of this process. With all that this year has wrought, I am counting my many new blessings, and aim to provide the best book yet with Hail. 🙂 Thank you, for all the love and support my reader’s have brought! I am one lucky author! ❤ If I don’t post beforehand, have a wonder and Blessed Thanksgiving! Quick FYI, I’ll be looking for Beta Readers by the end of December ;)! To my readers, my fellow authors, anybody just touching the glossy lake top of my life that is finally settling down, I have been through the ringer this month. In all honesty this year has proven one of the more turbulent that I have endured, but the past three weeks were a handful. Surgery: overall the important pieces fell into place, however recovery was marred with allergic reactions to bandages, and to top it off an allergic reaction something that I have not yet identified. I thought I knew, I did not. Shots, medications galore, and I’m finally healing up in a way that doesn’t make me look like a post-apocalyptic survivor from chemical/biological warfare. Today, though, I have received quite a treat-no, The Treat. As any author will tell you, receiving praise is an amalgamation of emotions: I’m not worthy, flattered into silent tears, excitement, wonder, appreciation, again feeling unworthy! Said review was provided for Snow, and can be found Here! I cannot emphasize enough to those who read my work, let alone my fellow readers of Any written works, the importance of sharing your opinion and rating of a book. This was heart warming for me, something I needed after my recovery plan failed miserably, I didn’t get to write and was instead suffering through the unspeakable. Many thanks to Booked J (Jessica Elizabeth) for the review, and I hope she enjoys Blizzard as much as she did Snow <3! Now, I cannot entirely complain. I had a weekend to remember, unlike anything before. There is worse that can happen, and this recovery is not complete. I’m struggling through the worse symptoms, but I’m finding my way-painful as it may be-and tomorrow I take a certification testing. Once that’s complete, I plan to pass, I will focus my efforts into completing Hail! I’m excited to both get back into writing Hail, because what I have so far has me feeling excited for how I will end this trilogy, and getting my cover designed! Fiona Jayde is Wonderful, both at her work product and as an individual. I’m also looking forward to working with my team when I complete this massive work of fiction, and not sure if I should good or bad based on the amount of work I’ll be providing them! Thanksgiving is coming up, Christmas shortly after, and New Years to follow…I have plans for Blizzard, and those will be announced next week <3! Post Op Update & Blizzard News! 8 days ago my gallbladder was removed. The recovery has been rough, as it turns out I’m allergic to the liquid bandage 😅, and naan bread. Hives and all, the past 8 days have not been great. However, internally all is well! Moving forward it’s all good! Had my post op check today and I’m set, I can start using my treadmill again-will start tomorrow-but was advised nothing strenuous. Now, for Blizzard news! I’ve begun placing Blizzard on all the other vendors that Snow is on and will be offering a temp discount closer towards the end of November for the ebook, so be on the lookout 😉! I haven’t done Any writing foe Hail, however 😰…something I aim to remedy tomorrow. I go back to work (day job) on Monday, with some hesitancy. All will be well, though. I know I will not meet my original goal for December release for Hail. January of 2019 seems more feasible, but the rest of this week will tell. I hope everyone enjoyed their Halloween 🎃👻❤️! Blizzard on Netgalley – Ending Soon – And Then Some! There are only four days left until my surgery. Two until the Halloween party. The more important date for you all, the countdown that matters more, is that in 8 Days Blizzard will be archived on Netgalley! You can access it Here, and get a Free ebook copy for you to read and review! Don’t miss out -^_^-! For me the exciting news is seeing the downloads every day for Snow – as it is Free and available on All ebook platforms! Or at least almost all, anywhere you can find it ebook it’s free ;)! The steady flow, though miniscule in numbers, is a positive sign. What matters about the upcoming surgery will be my opportunity to sit and focus on writing Hail, as anything else I would normally like to do will be limited. I’m nervous, though. I’ve been given, by numerous people, several warnings of the pain to expect, the discomfort, and explicitly told to treat the recovery as if it were a C-Section X_X. Yeah, that face there is me when I consider the implications. Well…I’ve dealt with worse pain before, so I can make it through this! No matter, the gallbladder has to go no matter what, and before it ruptures :S.
A positive note, I’m slipping out of the weird funk I had been in for the last several months. Today I started to do that thing that I have always done, narrating in my mind as I walk or drive, describing people I see in my mind through various types of characters. I know I’m not the only person to do this, but that’s how I know I’m getting back to where I need to be in order to write Hail. The 2nd quarter of this year was rough. I know that’s been the biggest impact to my life, but it’s turning around. Halloween, Thanksgiving, and Christmas. This is MY time of the year! November 1st, my Christmas decorations will be up-with the help of my sister xD! I’ll be fresh out of surgery so you know…but I owe my mother thanks in advance for all of her help with what’s coming, and my muffin (sister) as well! Family can be difficult, but I don’t know how I could have made it anywhere, let alone this far and successfully so, without them.